1. Recombinant antibody fragments do not contain the Fc part of full-length Ig molecules. Also, most recombinant antibodies are generated from human antibody libraries. Typical detection reagents like anti-mouse IgG can therefore not be used. For detection, anti-tag antibodies like anti-His or anti-Myc are a good choice. In case of human Fab antibodies, the use of a goat anti-human Fab secondary antibody is recommended because it gives higher sensitivity owing to signal amplification. Make sure the goat antiserum is directed against human Fab or F(ab')2, and is preabsorbed on serum proteins from other mammals like mice. 2. Bi- or multivalent formats of recombinant antibody fragments are recommended for most applications like Western blot or IHC because the higher avidity usually gives a better sensitivity in these assays. The bivalent Fab fused to bacterial AP (Fab-BAP) is particularly valuable: detection can be first tried by using the AP activity. In case the sensitivity is not sufficient, a rabbit antibacterial AP-peroxidase-conjugated antibody can be applied, which usually gives a huge signal amplification effect. The Fab-BAP format has been successfully applied in ELISA, Western blotting, and IHC. 3. When performing Western blotting with cell lysates, the treatment of the lysate with ultrasound for a few seconds before loading it on the gel often reduces the background in the staining because of disruption of DNA. 4. For IHC, take care that the slides do not dry in any step of the heat retrieval procedure or the IHC. 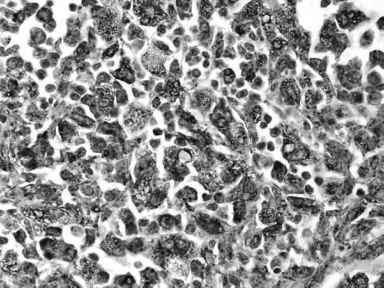 Optimal conditions for IHC detection must be determined for each individual situation. 5. In IHC, the use of His-tagged recombinant antibodies allows direct detection with mouse HRP-conjugated anti-His-tag antibody, and is therefore a quick but insensitive method because of low product yield. Because high concentrations of primary antibody are needed (10-25 p,g/mL), background might become an issue. In this case, the use of a mouse anti-tag antibody plus a biotinylated anti-mouse antibody is recommended, followed by a streptavidin-HRP conjugate. Alternatively, the DAKO Envision system, which relies on an anti-mouse antibody bound to a HRP-labeled dextrane backbone can be used as well. 6. If IHC on murine tissue with low concentrations of primary antibody should be performed, the use of anti-mouse tertiary antibodies for detection will create high background staining. In this case, the use of tyramide-amplification systems is recommended. Here, the respective epitope of interest is marked with peroxidase via specific antibodies, and the labeled tissue is then incubated with biotinylated tyramide and H2O2. The peroxidase catalyzes a reaction resulting in "radicalized" tyramide, which then binds covalently to nearby tissue molecules. Finally, the biotin on the bound tyramide can easily be visualized by standard avidin biotinylated enzyme complex (ABC) techniques. This method needs only very low primary antibody concentration of 0.1-1 p,g/mL.